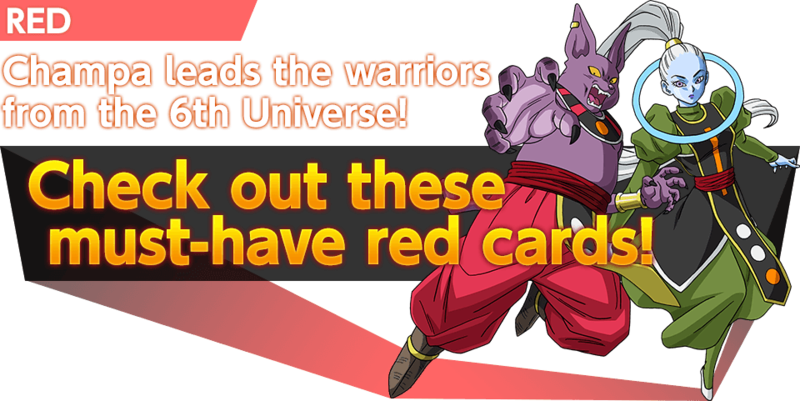 Let’s take a look at red and green cards from GALACTIC BATTLE! Red’s all about power, while green’s all about destruction! 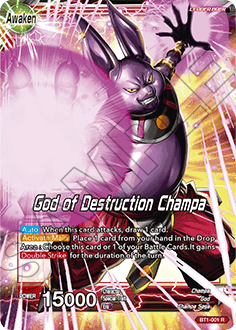 Champa, God of Destruction, is one of red’s Leader Cards. Discard a card from your hand to give Double Strike to him or one of your allies! 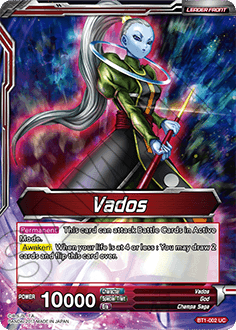 Vados gets +5000 power every time she attacks a Battle Card! Bring an end to the round quickly by overwhelming the opponent! Evolve into this card to deal 2 damage directly to your opponent! Push into the endgame and use Hit to end things in an instant! Cabba’s awakened into a Super Saiyan! Evolving puts him into Active Mode and allows him to attack twice! 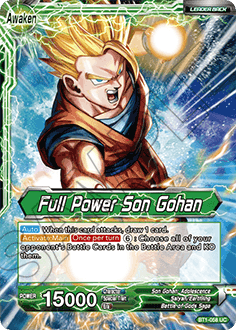 A great combination with BT1-04, Saiyan Cabba! Magetta’s ready to rumble with a skill that prevents him from being KO-ed! 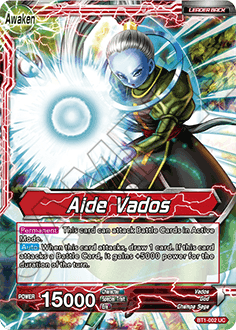 Pair him with Leader Cards like Vados to give yourself an ironclad advantage! 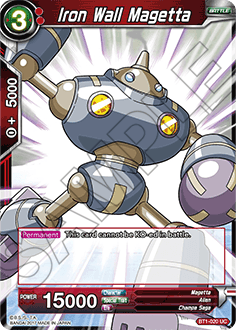 This one-cost card that you can use during your Main Phase lets you KO any Battle Card with 12,000 or less power. 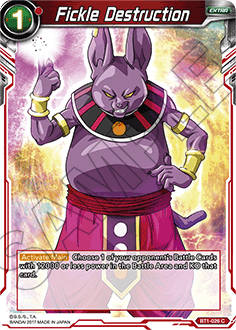 Unleash the power of the god of destruction! 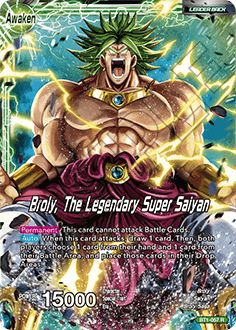 The supremely destructive Broly appears as a green Leader Card! Whenever he attacks, both players have to send a card from their hand and Battle Area to the Drop Area. 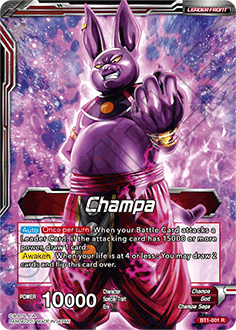 Combine him with Broly’s Ring, which we’ll introduce in a moment, to make him utterly unstoppable! 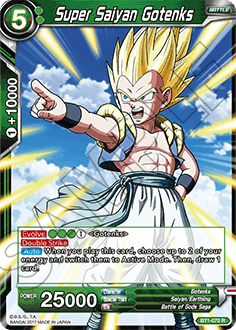 A super powerful card that allows you to pay six energy to destroy all of your opponent’s Battle Cards in their Battle Area! 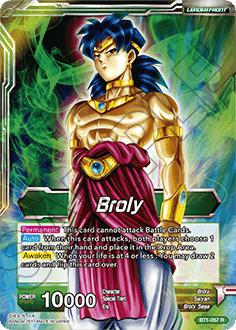 Broly has an extremely powerful skill that lets you pick two cards in your opponent’s hand and destroy them! 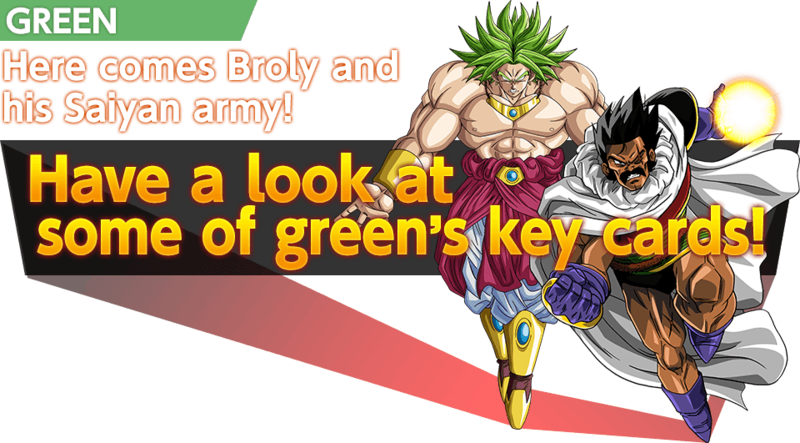 And true to form, Broly has Evolve and Double Strike! 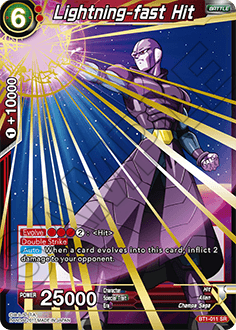 No other card can match his devastating power! 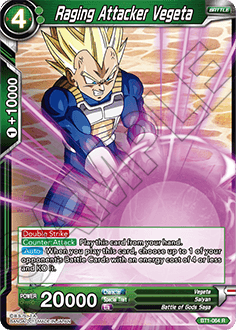 Armed with a powerful counter-attack skill, Raging Attacker Vegeta can drop in during your opponent’s turn and wipe out one of their Battle Cards! 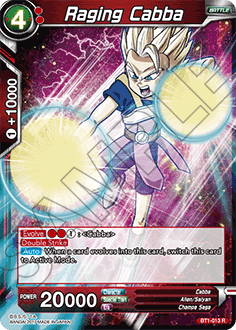 Super Saiyan Gotenks has both Evolve and Double Strike, and since he switches two of your energy back to Active Mode and draws you a card, he’s super efficient! This card has Evolve and Double Strike too! 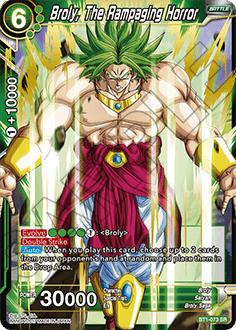 And since he forces your opponent to discard two cards, Bio-Broly is the perfect pick for discard combos! 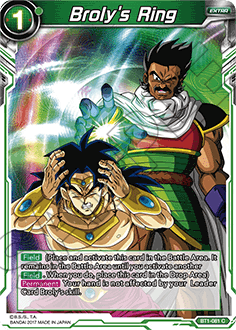 This card prevents Broly’s skill from affecting you! 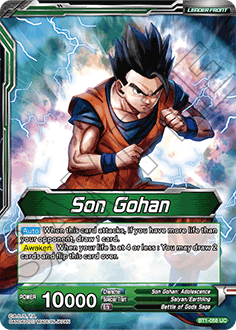 If you’re building a deck around Broly, you need this card! Use red’s power-ups and direct damage to lead the charge on your opponent! 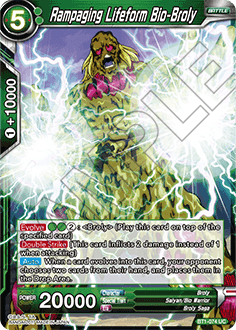 Green’s emphasis on destruction lets you force the situation to your advantage and overwhelm your opponent!